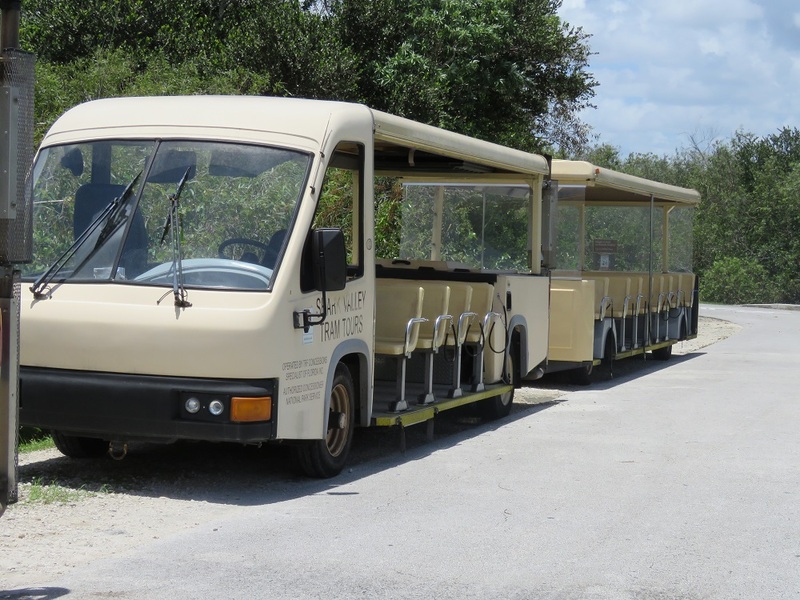 The Shark Valley Tram Tour was our favorite part of the day we spent in the Everglades National Park. 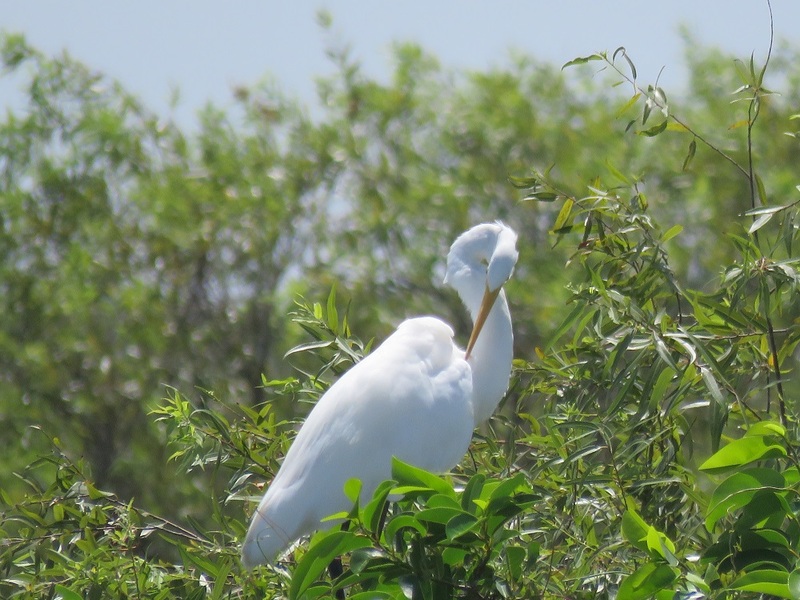 With the assistance of a park ranger, we were able to learn a great deal about the park, the natural environment and see a variety of animals including baby alligators, great blue heron, great egrets, a cormorant and an anhinga. The two hour tour of the northern section of the park goes about ten miles into the park to an elevated platform, which allows you to see for miles, and then returns to the visitor center on a different route. Below is a photo of the tower. You can’t go all the way to the top of the tower (they have the stairs blocked off) but you still have a pretty good view. The view was nice but the real reason that we loved the tour was that it allowed us to see things that we would have missed on our own as well as learn about different features of the park that we would not have known about without the park ranger. The driver and guide were fantastic at spotting animals and making sure that everyone had an opportunity to see and take pictures. We would not have seen the baby alligators otherwise because we wouldn’t have known where to look. There was also plenty of information that made the trip interesting which we never would never have learned without the park ranger – such as information about the alligator mounds and flowers of the area. 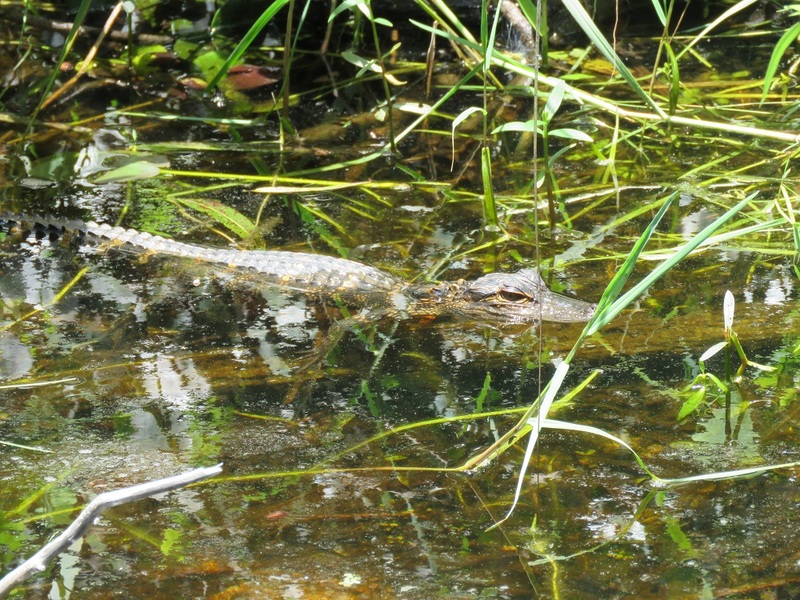 The first photo below is an adult alligator that was spotted towards the beginning of the tour. 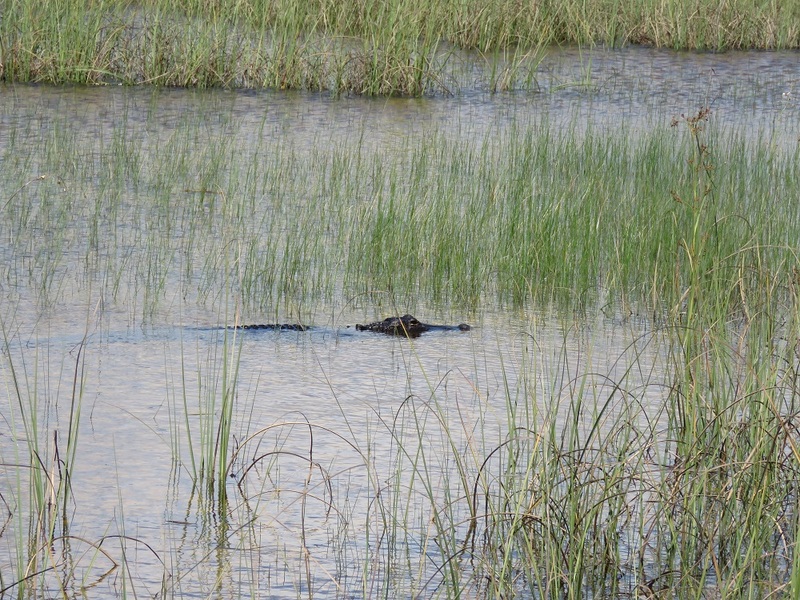 The second photo is an approximately one year old alligator that was spotted on the return trip. 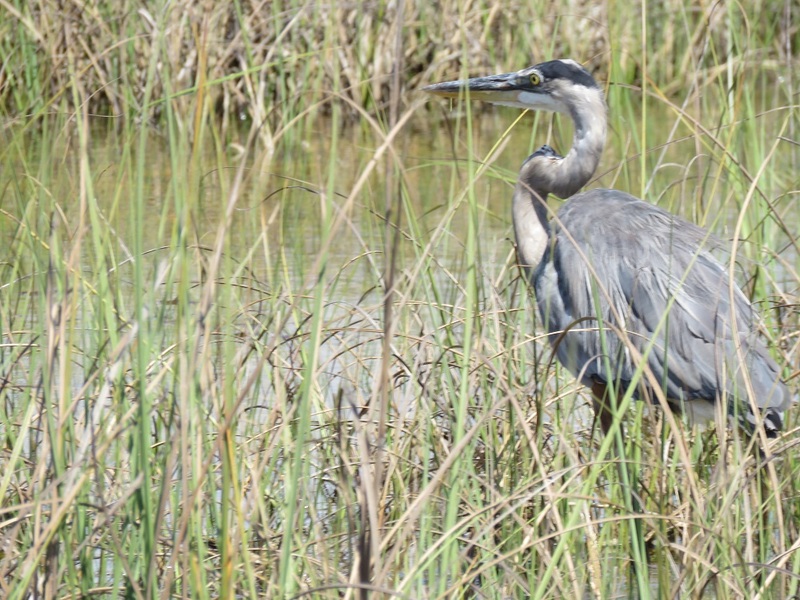 We definitely saw more animals in this section of the park on the tour then we did in our walk on the anhinga trail and on the drive to Pa-Hay-Okee. If there was a similar tour offered in the southern section of the park that had fit into our schedule, we probably would have done it as well. 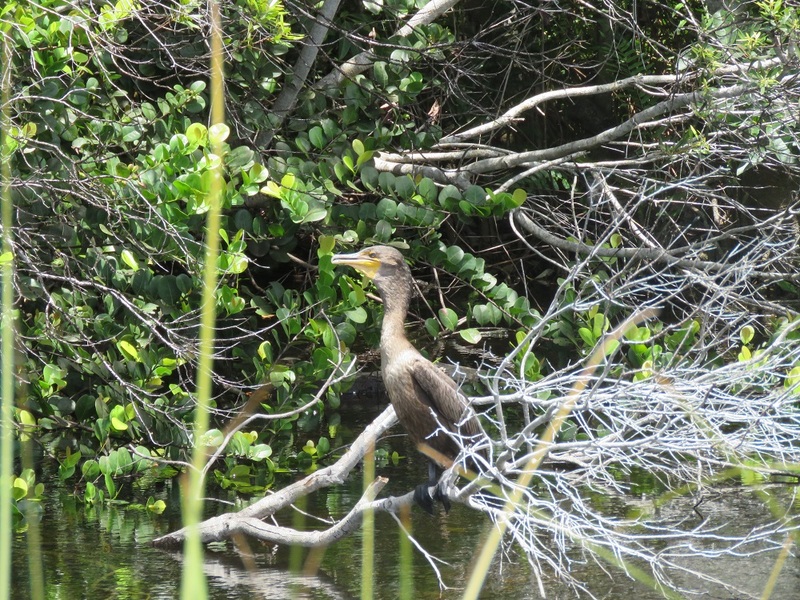 We were there in the offseason though and we missed both of the guided tours at the Anhinga Trail which were earlier in the day. The tower also provided a great 360 degree view of the surrounding area. The one problem with the tour is that it is a pretty quick stop. You only have about 15 minutes on the elevated platform to take pictures and look for wildlife before you have to start heading back to the tram. It is plenty of time to look around and take pictures. 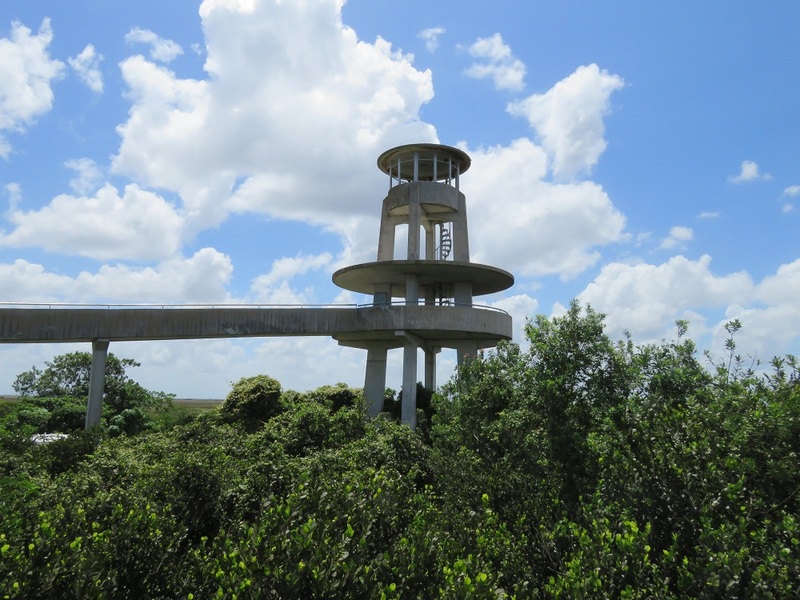 For those who want more time to observe the area, the Pa-Hay-Okee tower is a great alternative option which is roughly halfway between the southern entrance to the park and Flamingo. We stopped at both and found each interesting. The visitor center is divided into a small section for the tram tour and another section with the informational displays and gift shop for the park. As you enter the building from the parking lot, the check-in area for the tram tour is on the right. Once we bought our tickets – $25 each for adults – we went to the outside waiting area to apply sunscreen. We should have applied bug spray, but we forgot despite having it in the bag and we ended up getting more than a few mosquito bites on our legs. 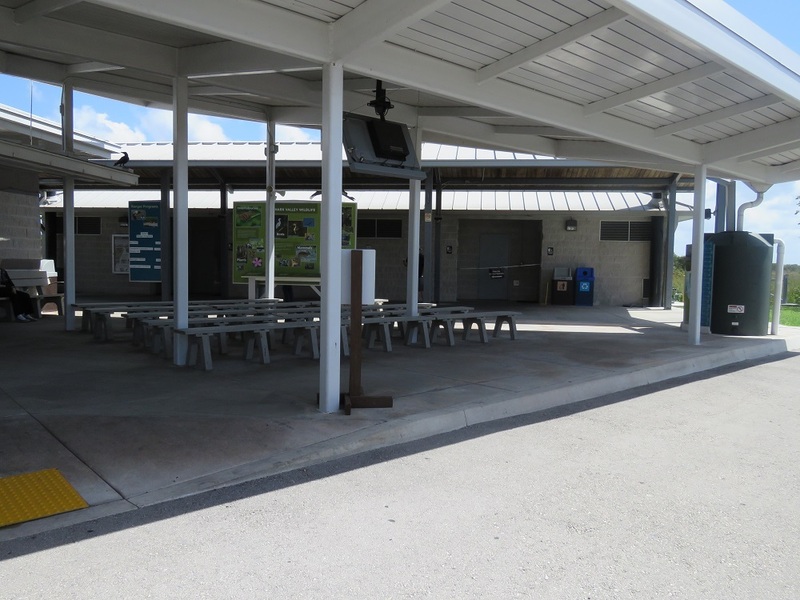 Outside, they have a group of benches for people waiting, a video with information about the park, a few more informational displays and another building with drinking water faucet and restrooms. 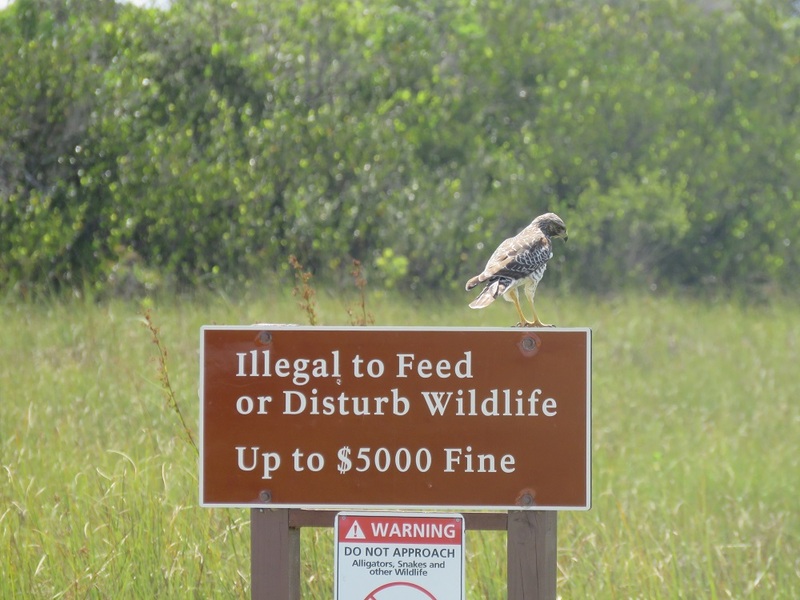 We were also entertained by a hawk that was perched on a nearby sign warning guests not to feed the wildlife. When the birds are waiting for you to start the tour, that is a good sign! The tours run throughout the day with different times in the winter and the summer. We took the 11 AM tour because we couldn’t get down from Orlando earlier and we thought it would be better to make it through before the hot afternoon sun. There was a nice breeze while on the tram so it wasn’t too bad despite temperatures in the low nineties. The other option to see the area is by bike. They rent bicycles at the visitor center. This allows you to move at your own pace but you obviously need to be prepared to bike 15+ miles in the heat. If you are going to do it, be sure to bring water. The park ranger had great stories to tell about events in the park and added a personal touch to the stories about his own adventures through the park. He filled the time between sightings with interesting stories and educated everyone well. We definitely learned more about the area than we would have if we were biking. We returned to the visitor center around 1 PM. We spent some time watching the fish in the canal and then did a little shopping at the visitor center. In total, the Shark Valley Tram Tour cost us $50 for two people and two hours of our lives. 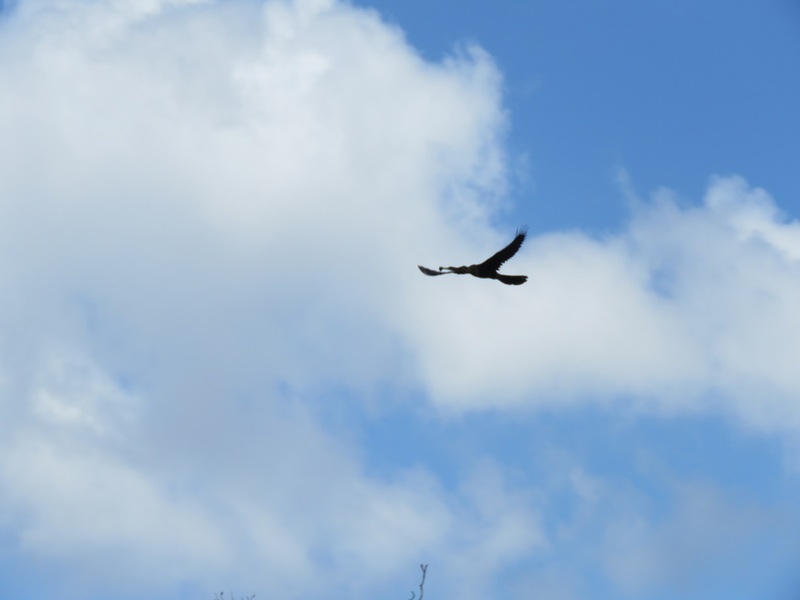 It left us with a few great stories about the area and fantastic photographs of the park’s wildlife. We will definitely do it again! We drove in from Orlando that morning so we were heading east out of Miami. 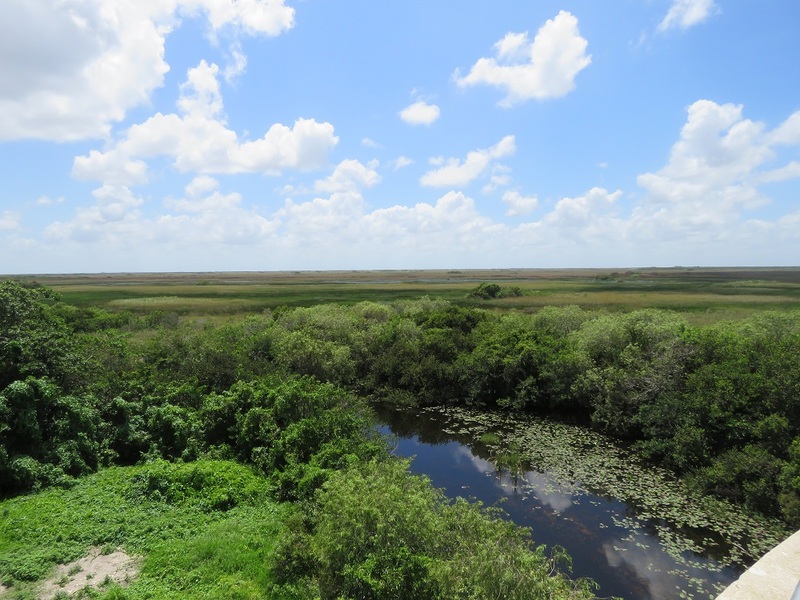 The route to the visitor center is a two lane highway that is lined with a canal on one side and plenty of businesses offering airboat tours on the other side. The highway is under construction because they are elevating it to improve water flow into the national park. 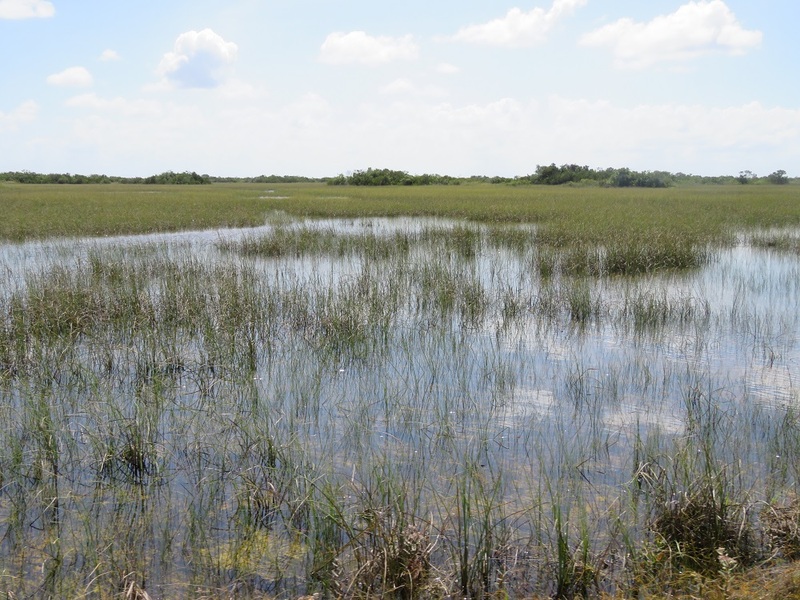 The highway slows the entry of water into the park and is allowing pesticides from farming between Lake Okeechobee and the national park to build up. The park ranger leading our tour was optimistic that the elevation of the highway would return water flow to its historic levels and flush the pesticides out of the area. Because of the construction, be sure to allow some extra time to make a tour. We were running a bit late and were stopped for a few minutes as the road went down to one lane due to the construction. We ended up making it to the tour in plenty of time since our goal had been to arrive thirty minutes before the start, but we would hate to see you miss a tour time because of a construction delay. Two other possible fun options for people taking the tram tour are to (1) take an airboat ride or (2) drive the Loop. 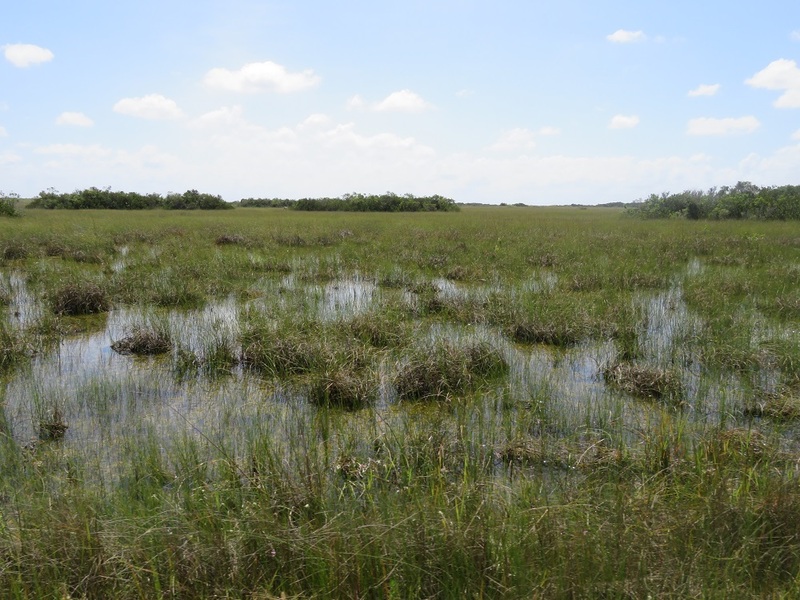 Loop Road goes through Big Cypress National Preserve. We only had a few hours in the area, so we made the just over one hour drive to get from Shark Valley down to the southern entrance to the park after.